Conversion optimization is such a big topic in digital marketing today and for good reason. A well-executed conversion rate optimization strategy will increase your business’s ROI and also help identify what works and doesn’t work with your audience. If you’re a regular reader of the Justuno blog, you’re well aware of CRO strategies but its always good to get a variety of perspectives and focus. Below, I’ve provided a list of 10 conversion optimization blogs that I read on a consistent basis. There’s some great variety and I guarantee at least one of these blogs can help you optimize your business. 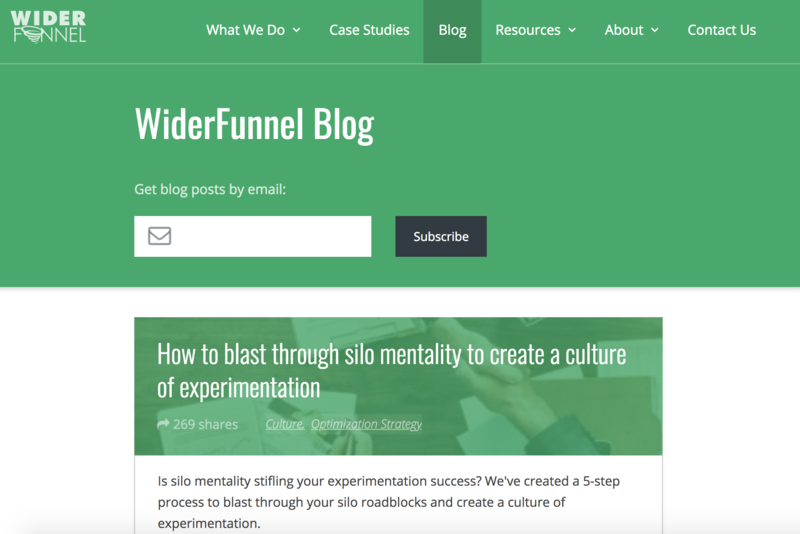 WiderFunnel, a conversion optimization agency, turns their expertise into valuable articles that cover the full scope of website optimization. 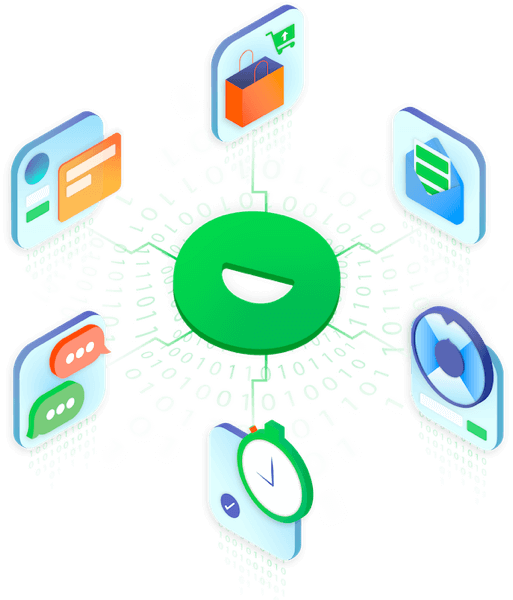 Rather than strictly focusing on the numbers game, WiderFunnel also dives into topics like consumer psychology, customer/user experience, and marketing relevance to provide insights into why people take action and convert. This blog is a must read for any marketer who wants to understand the reasoning behind conversion optimization. For a company that so heavily focuses on content marketing as a key aspect of inbound marketing, they certainly have practiced what they’ve preached. The HubSpot blog is split up into three categories: marketing, sales, and customer success. 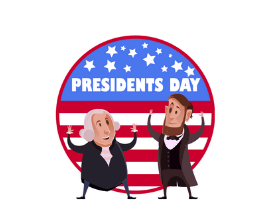 They provide a broad scope of topics but do have the resources to dive into the details of each topic so you can get helpful insights and actionable tips. CopyHackers is the ultimate resource for optimizing your copy for conversions. 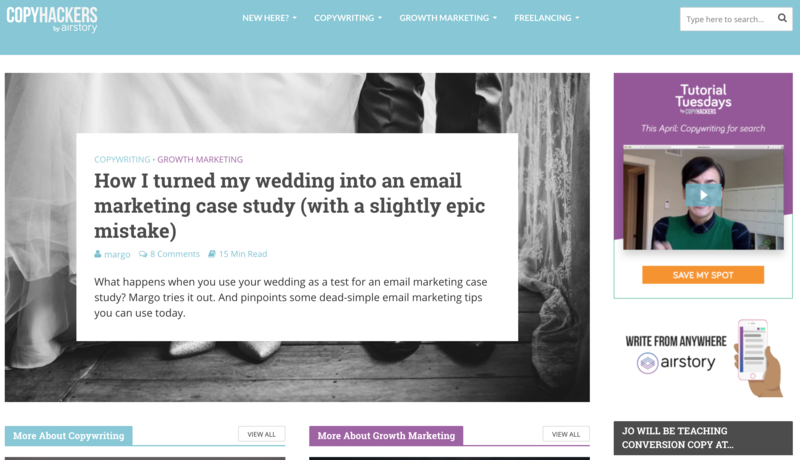 With tons of applicable case studies for every type of online business, you’re bound to find something that will help you optimize website copy, marketing content, and emails. I’m continually blown away with how well CopyHackers executes covering this aspect of CRO! For a destination that is much more e-commerce focused, give the Shopify Plus blog a look. Many of the articles showcase strategies that are being underutilized by most retailers so this is a great place to go to get new ideas and inspiration. 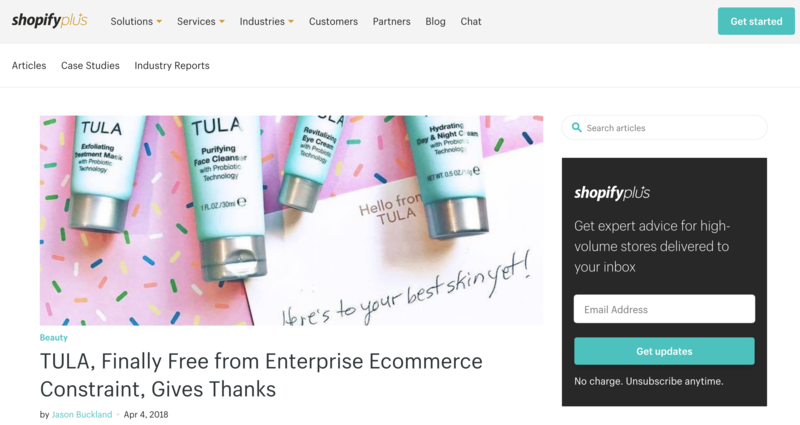 I particularly enjoy the articles that focus on strategies for specific e-commerce verticals because the information is hyper-relevant to those particular retailers in those markets. Digital Marketer is an excellent resource for any marketer, regardless of industry. Topics cover everything from content marketing to chat bots, all with helpful information to get you acting, not just reading. In addition to the blog, Digital Marketer also hosts a podcast called Perpetual Traffic and has paid resources for marketers looking to go deeper. All in all, this blog is impressive so go subscribe! This has to be one of the best data-driven email marketing blogs out there. 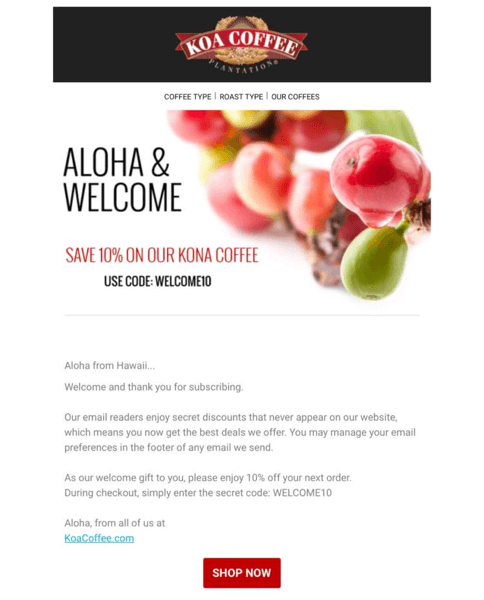 When it comes to driving sales from marketing emails, the Rejoiner knows what they are doing. One of the refreshing things about this blog is combining visual, inspirational examples while also providing data and reasoning behind why these emails work. 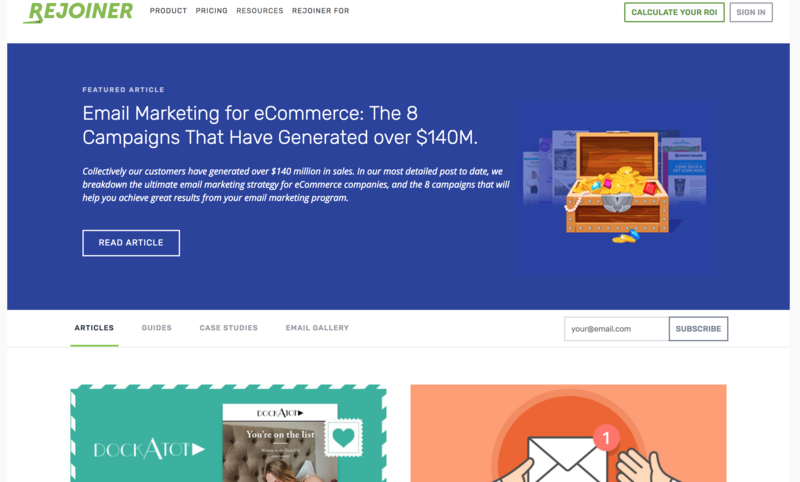 If you’re looking for some resources to help you optimize your email marketing campaigns, the Rejoiner blog deserves a look. 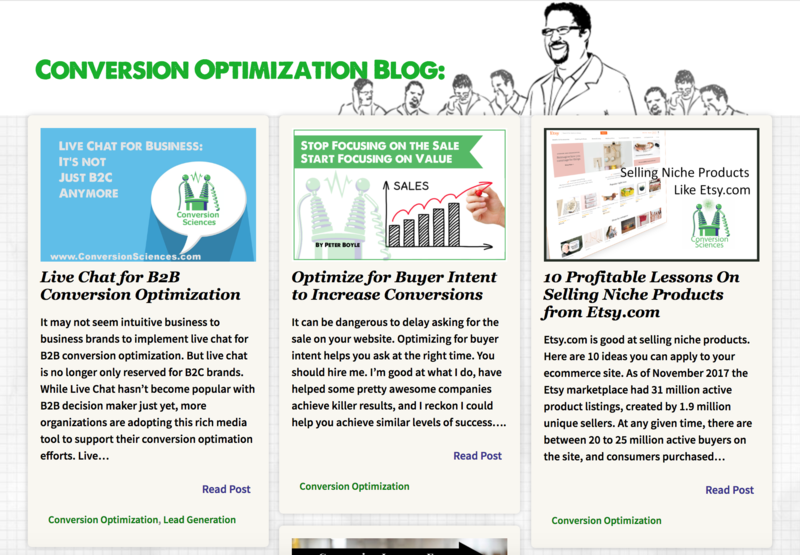 When asked about conversion optimization blogs, ConversionXL is usually the first one that I recommend. Why? It’s got something for everybody. Whether you’re in e-commerce, SaaS, or publishing, there are going to be helpful resources that speak directly to the questions/problems you have. There’s a ton of information on this blog but everything is organized for easy navigation to find what you’re looking for. Brian Massey, aka the OG Conversion Scientist, brings his knowledge and experience while wearing a lab coat so you know he means business. Yes, there are a ton of articles, but in typical conversion optimization fashion, the team at CS provides an intro email course featuring 9 selected articles to help you get started. I love this strategy both from a conversion standpoint and also as a subscriber. KlientBoost focuses on improving conversion rates of your PPC and re-targeting campaigns. Their blog is no different. 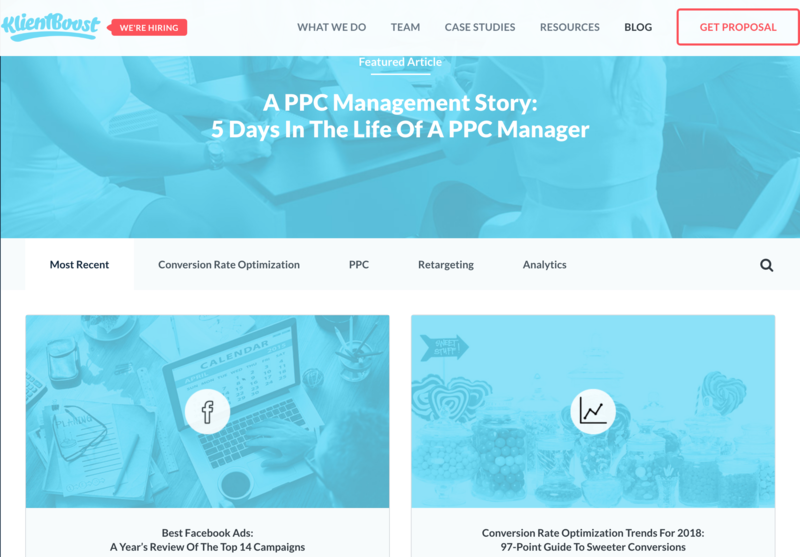 While much of the content focuses on optimizing PPC marketing and re-targeting, they also provide broader CRO articles for readers wanting more. KlientBoost also has a bunch of content on setting up Google analytics and conversion reporting so you can get accurate data to optimize campaigns moving forward. 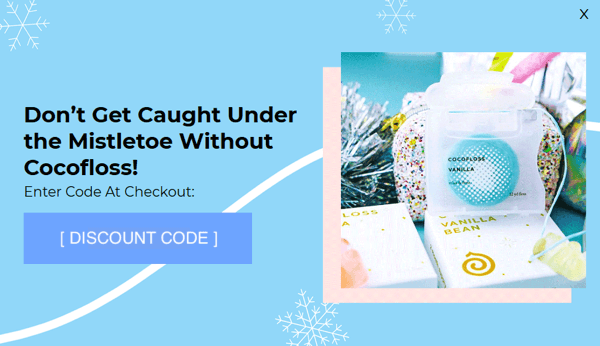 In addition to the amazing name, AcquireConvert also features tons of great content to help you optimize your online store. Most of the articles on this blog are incredibly actionable, giving you something to implement on your site that day. 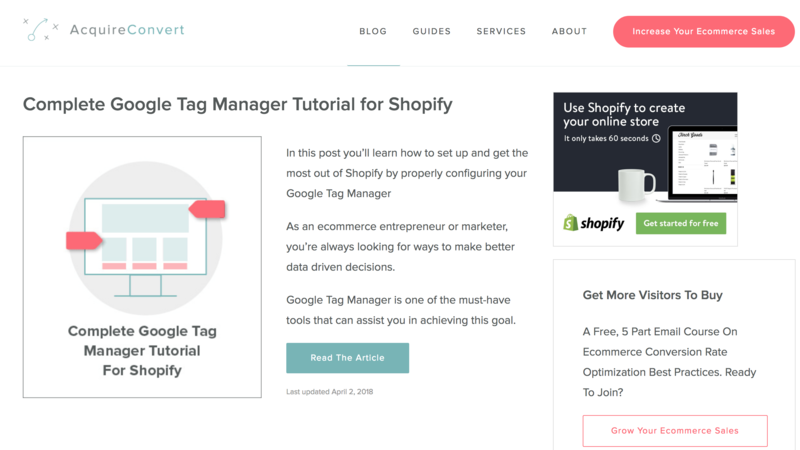 These can be great examples of successful brands or list posts to showcase useful conversion strategy for your store. This wouldn’t be a list post without some shameless self-promotion! 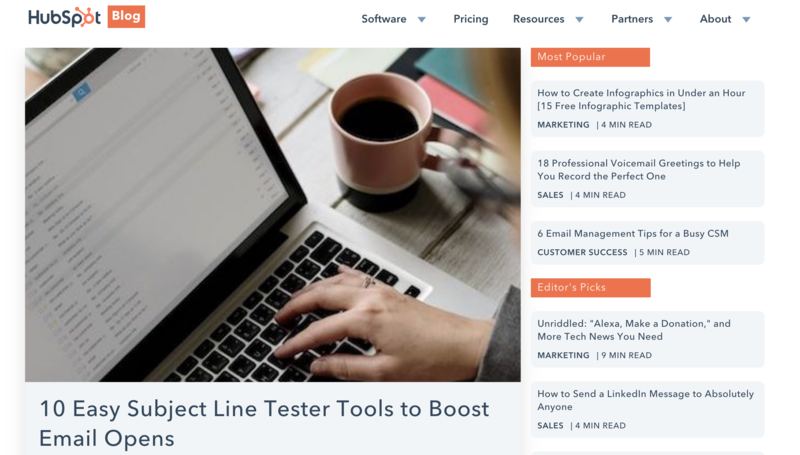 On a more serious note, the Justuno blog is a great resource for marketers who are looking to improve on-site marketing, conversion rates, and sales revenue. 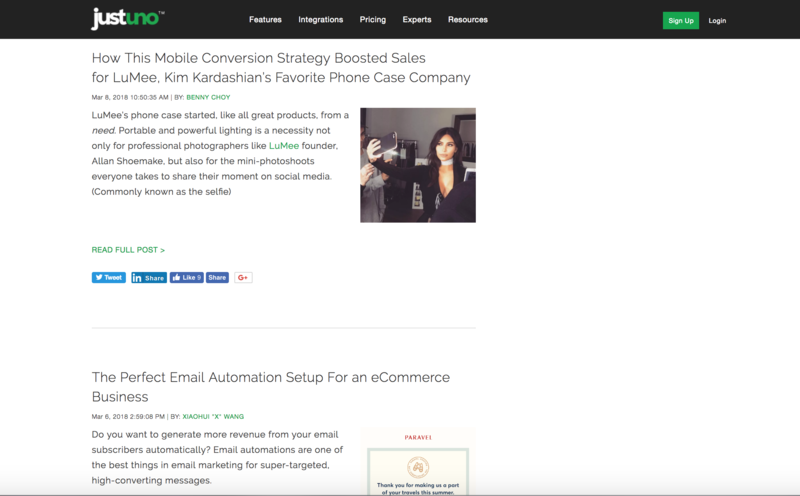 The Justuno blog does heavily focus on e-commerce conversion optimization but the range of articles does cover other verticals. We try to cover a variety of topics from tips and best practices for marketing to highlighting other e-commerce apps who are killing it in their fields. 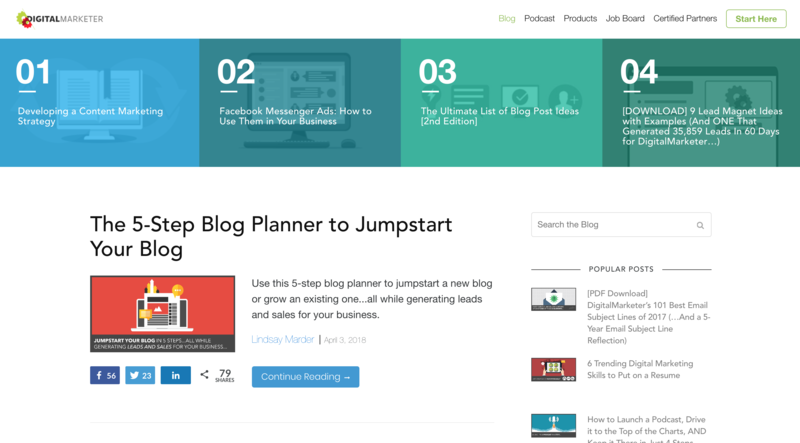 With post frequency increasing, now is the time to subscribe to the Justuno blog! You’re already here! Check out our most recent articles on the Justuno blog! 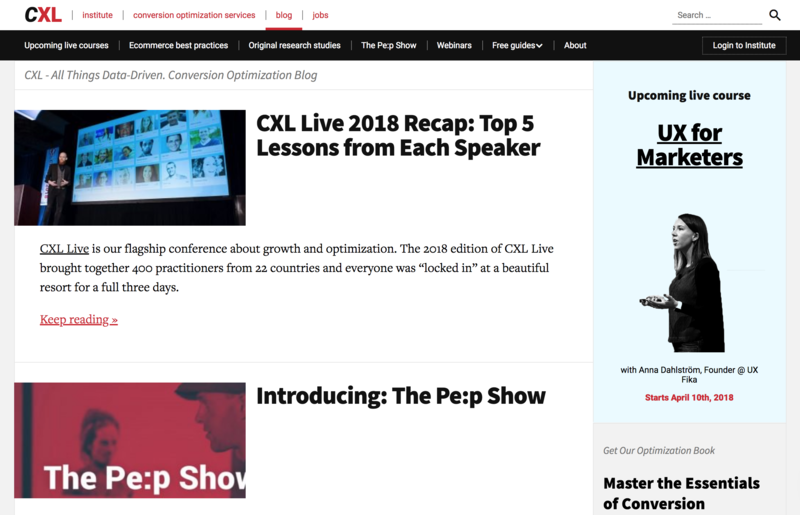 I hope you enjoyed this list of valuable CRO blogs to help you optimize your online business for more conversions and revenue! We’re always looking for great content, so share your favorite conversion focused blogs with us in the comments section below!